The army of private sanitation trucks that race through New York City’s streets every night are often in poor repair, with trucks routinely being declared unsafe and pulled off the road by government regulators. The company’s safety record — and the failed February inspection incident involving wheel safety — has now come under scrutiny after a wheel flew off a Century Waste truck on Wednesday and killed a motorist. The truck tire sailed over the center median of the Gowanus Expressway in Brooklyn and crashed through the windshield of a car driven by Robert Martinez, a 64-year-old civilian employee of the New York Police Department. The police said the truck that lost the wheel was inspected further at the crash site, and was hit with 16 summonses for as-of-yet unspecified “equipment violations.” It has yet to be determined if the truck involved in Wednesday’s fatal accident was the same one that failed the February inspection. A spokesman for the police department said the case had been referred to the NYPD’s crash investigation unit. 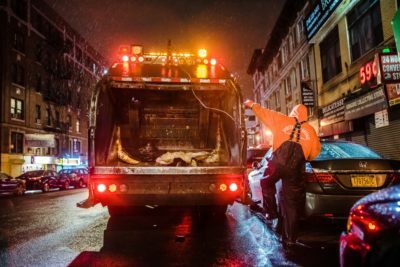 The Business Integrity Commission, or BIC — the city agency that licenses and oversees private garbage companies, which handle trash from businesses in New York City — said in a statement that its authority on the safety of private trucks was limited. BIC did say it had “requested” that Century Waste “re-inspect all their trucks immediately” and report back. ProPublica did not get an immediate response to a series of questions sent directly to Century Waste’s owner asking about the deadly accident, as well as the company’s history as a prominent trash hauler in the city. It’s unclear if any of the safety violations found with Century Waste’s trucks in recent years rose to that standard for concern. “Reckless disregard for safety seems to be the rule, not the exception, among private carters,” City Councilman Justin Brannan said in a statement about the crash, which took place in his Bay Ridge, Brooklyn, district. Brannan and other politicians repeated calls for comprehensive reform of the industry. The often rogue world of private trash collection in New York City has been the subject of reporting by ProPublica, the Investigative Fund and Voice of America in 2018. It is an industry rife with concerns over safety, fair wages and lax oversight. 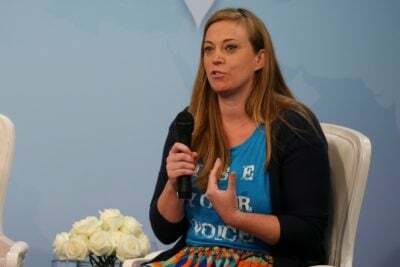 In May, politicians and advocates accused BIC of weak regulation of the private trash industry after ProPublica revealed that a troubled company’s trucks were involved in the deaths of two people in under six months — one of whom was an off-the-books worker whose death was covered up. The company, Sanitation Salvage, said at the time that safety was its first priority. 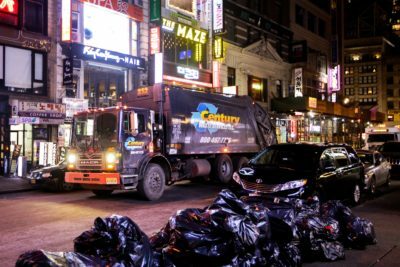 Trucks operated by New York City’s 50 biggest garbage companies are pulled off the road and declared unsafe to drive after 53 percent of government inspections, according to an analysis of data from the city and the Federal Motor Carrier Safety Administration. Fourteen of those 50 companies hadn’t been inspected even once in the past two years. Nationally, commercial trucks are pulled off the road after 21 percent of inspections. ProPublica’s reporting earlier this year found other instances of wheels coming off trucks. Rodney Miles, a former driver at a different private trash company, said a wheel of his truck once came off while he was driving on Canal Street in Staten Island. The company declined to comment. Ernesto Waight, another driver at yet another company, said a wheel rolled off his truck on Astoria Boulevard in Queens. The company defended its safety record. Century Waste is owned by Marc Savino. He founded the company after his father, Frank Savino, agreed to a lifetime ban during the city’s 1990s crackdown on organized crime and corruption in the private trash hauling industry. Sweeping prosecutions broke up the mob’s control of the industry and toppled many garbage companies that had profited in the cartel system. 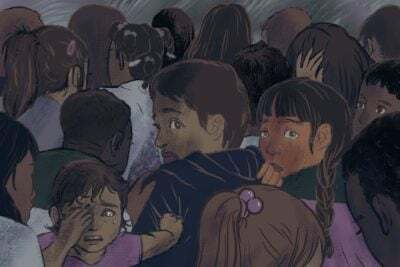 Although several members of the Savino family agreed to lifetime bans, none were indicted, and the ban agreements did not include admissions of wrongdoing. However, a 2015 BIC decision to deny another company’s application for a hauling registration included some material about the Savino family’s prior dealings in the business. 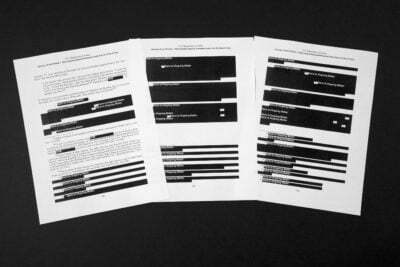 ProPublica sent questions concerning the BIC document to Marc Savino’s email. We will publish a response if we receive one, as we will if we hear from his father, Frank.